Geoff Murray, Marj and Jack Whybrow and Nyssa Young spent Sunday at the Albury races. They are pictured next to the mounting yard before the running of the SDRA heat. Former Harden locals and well known horse trainers, Scott Spackman and Chris Heywood converged on Albury on Sunday in their quest to qualify for the Country Championships Final, to be held at Randwick in April. Didn’t Even Kiss Me warming up in the mounting yard before the SDRA heat. Spackman had Didn’t Even Kiss Me lining up in the $150,000 race whilst Heywood nominated 6 runners and had 5 starters in the 16 horse field. Heywood had Fermanagh Lad, Lighthouse, Husson’s Shout, Class Clown, and Delivered. All smiles: Brittany Heywood with Lighthouse before the SDRA heat. It was the third time Spackman had a runner in the Championships heats. He finished 2nd in 2015 qualifier and came midfield in the Final at Randwick the same year. Didn’t Even Kiss Me came home in 14th place, 8 lengths off the leader whilst Heywood was unlucky not to qualify Fermanagh Lad who led for much of the race beaten by 4 other runners over a margin of just 1.6 lengths. His other runners finished in 10th, 11th, 13th and 15th place respectively in a high quality field. Corazon De Oro plays up for the camera after a 3rd place in her first start for Chris Heywood. The Championships was inaugurated in 2014 as a “Grand Finals” concept to feature and showcase the very best of Australian racing as the jewel in the crown of Sydney’s Autumn Carnival. 2017 will witness the fourth year of this exciting initiative, launched by Racing NSW in partnership with The Australian Turf Club and supported by the Government of NSW. 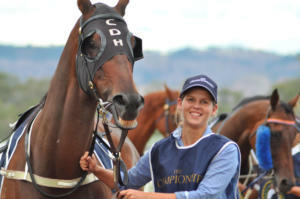 Held on the first and second Saturday of April each year, The Championships’ twelve races will be hotly contested to determine champion status over different age groups and distances. Glittering emerald encrusted trophies, designed by acclaimed Sydney jeweller Cerrone are awarded to the winning owner, trainer and jockey of each race. With a total of $20.2 million prizemoney on offer, the stage is set for two days of exciting and highly competitive racing. The very best horses in Australia will compete against some of the finest international contestants, at what is a feature occasion in Sydney’s social and sporting calendar.